Can I really start a daycare business using your Daycare Success System? What if I purchase your System but then decide not to start a daycare? How many other people have used this System to start a daycare? Why is this product better than other Daycare Starter Kits? How is the digital e-product version different from the Shipped Deluxe version? I am looking to purchase the Daycare Providers Workbook. Where is it on your site? Are your products compatible with Mac / Apple? What formats are the files in – do I need anything special to download them? Can I easily customize the daycare forms to fit my daycare? Do you accept checks by mail or by phone? What happens after I place a credit card order? What happens if I don’t get my order when I think I should? How long has your company been online? Who owns The Daycare Hotline Website? Can your products be purchased for resale? Is it okay to copy any of your products and resell them? Can I copy the forms and other parts of the products for my personal use? Do you endorse the sites linked to the Daycare Hotline Website? Do you recommend or endorse the providers listed on the Daycare Search? Why do you have disclaimers on your Parent Information pages and the Daycare Search Pages? How can I benefit from Advertising on the Daycare Hotline Website? Why don’t you charge parents for the information on your site? How much does it cost to advertise my daycare on your site? How do I update my Daycare Ad? Yes, you can! The Daycare Success System takes you step-by-step through the entire process of starting a daycare in as little as 4 weeks. You are provided with actual checklists of questions to ask your local & state regulators, insurance companies, and other key professionals. I guarantee your satisfaction or your money back. You may wish to keep the System to pass on to other friends or family members, or in case you change your mind sometime in the future. However, you may return the System within one full year of the date of purchase, 100% guaranteed full refund, no questions asked. Over 2,000 people just like you have started a daycare using The Daycare Success System. In fact, there are over 300,000 family daycare businesses in the U.S. alone, so you have quite a large network of other providers and mentors to help you get started in this meaningful, rewarding, and often quite profitable business. What free information do you have, so I can decide if being a daycare owner is right for me? Click here to access the best free information on the Internet for new home daycare owners. Click here to read our top-rated NEW article – “How to Start a Daycare“. The Daycare Success System is more comprehensive than most other daycare starter kits, and contains more detailed how-to steps and worksheets. This System contains a two-hour Audio Companion, so you can sit back & listen to the guide walk you through the workbook, step by step. It also contains 6 hours of audio interviews with child care experts, which no one else offers. The actual content of the two products is exactly the same. The only difference is whether you receive the content digitally (via your computer) or in the mail. 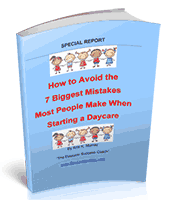 The Daycare Providers Workbook was originally written by Cyndi Beauchemin, the founder of Daycare Hotline. Kris Murray purchased all rights to the products and website in 2007. The Workbook has been updated for 2011, and was re-packaged as the Daycare Success System Workbook. It is available as part of the Daycare Success System. All components of the Daycare Success System are compatible with Mac except for the daycare forms, which are in Microsoft Excel & Word format. If you have a Mac, you can still access the PDF versions of the forms with Adobe Acrobat Reader. The workbook, Fast-Start Guide, bonuses, and transcripts are all in PDF format. To get the latest Adobe Acrobat reader, click here. The audio files are in MP3 format and should easily play on your computer or iPod. You can also burn them to a disc and listen to them in your car. The daycare forms are in MS Word and/or Excel format. Yes, as long as your have Microsoft Word and Excel on your computer, you can customize the forms and make as many changes as you like. Simply click on the Product or Service you would like to purchase. You will be automatically redirected to a different URL – this is our Secure Server where our Shopping Cart is hosted. Fill in the Credit Card Information or print out the form and mail/fax it with your payment. If you are ordering a digital product, you will then be taken to a download page where you can access all the products and download them to your computer. Simply right-click on each item and download it – it’s easy! If you are listing your daycare with us, you will receive an email with the instructions for how to create your ad & update it as needed. Email us at: Is it safe to order online? You may also print out the order form, fill it in, and FAX your order to: (970) 444-1098. We do NOT accept Checking Account Information by Phone or Checks by Mail. If you want to pay by check, use the E-Check option in the online shopping cart. What happens after I place an Order using my Credit Card? Your product will be shipped within 5 business days. Daycare Hotline products are shipped within 5 business days by USPS. Please allow a total of 7-10 days for delivery from your order date. • By United States Postal Service Priority Mail. What happens if I don’t receive my products when I think I should? If that doesn’t answer your questions, email us at: Do you ship C.O.D.? We will ship to Canada, Mexico, and the U.K. If you live outside the U.S., please contact us via email and we will provide you with special shipping fees and instructions. Is the Daycare Success System available in Book or Retail Stores? No, our products are only available on our website. Not at this time. If you would like more information about being an affiliate or partner, please call or send an email to Kris Murray at support@childcare-marketing.com. No! The products displayed on this Website are copyright protected. They may be used by the purchaser for personal and/or day care business use only. These products may not be copied, redistributed or resold in part, as a whole or in addition to any other collection. By purchasing any of our products, you agree to those terms. Can I copy the forms and other parts of the products for my personal use or use in my day care setting? Yes! You can copy, edit and customize any part of our products for use in your home day care or day care center setting. Who owns the Daycare Hotline? The Daycare Hotline dba Daycare Systems, LLC is owned by Kris Murray. Do you endorse the sites and/or products on the Links Page? Some of sites listed on our links page, are paid ads, which offer products or services for day care providers and/or parents. If we receive complaints about an ad, it is investigated and if needed those businesses are removed. However, we cannot endorse those sites or businesses listed. If I place an ad on the Daycare Hotline, how do I know I will benefit? With any advertising, there is never a guarantee. We do make every effort to assist you by receiving a high ranking in the search engines. Over the past few years, we have reached an average of 8,000 to 10,000 unique visitors per month. How much does it cost to have an ad? Annual membership is $30 per year. Six-month membership is $18. Banner ads are available. For more information email us at: How do I update my Daycare Ad? Ads can be updated for free. Although we prefer you to use our ad update form (which you received via email at sign-up time), if only a few changes need to be made, they can be email us at: How do I renew my Daycare Ad? Daycare Hotline will send you a renewal notice at the time of renewal, and your credit card will automatically be charged. We believe that the best way to get a high volume of qualified leads to you is to not charge parents. If a parent has the right information, both their family and day care provider benefit. Do you recommend any of the providers listed on the Daycare Search? The providers listed on our day care search are paid advertisers. We cannot endorse or recommend any of the providers listed. It is your obligation as a parent to thoroughly interview and choose the right provider for your child(ren). The information and day care providers listed is intended as a resource for parents, not a service for hire. In the future we may change this, but as it stands our focus is on assisting providers. This site is owned and operated by Kris Murray. All materials on this site including, but not limited to, images, text, illustrations, audio, video files and the selection, coordination and arrangement of such materials (collectively “Intellectual Property”), are protected by copyrights, trademarks, service marks, or other proprietary rights which are either owned by Kris Murray or owned by other parties who have licensed their intellectual property to Kris Murray. Except as expressly authorized herein, material from this web site may not be copied, reproduced, republished, uploaded, posted, transmitted, or distributed in any way. Use or modification of Kris Murray’s intellectual property in any form, including but not limited to use on any other web site or networked computer environment, without express written authorization is a violation of my copyrights and other proprietary rights and is strictly prohibited. We stand by our products. We promise a full refund within one full year of delivery if you are not completely satisfied. If you purchased a shipped kit, you must return the product undamaged in the original packaging in order to receive your refund.